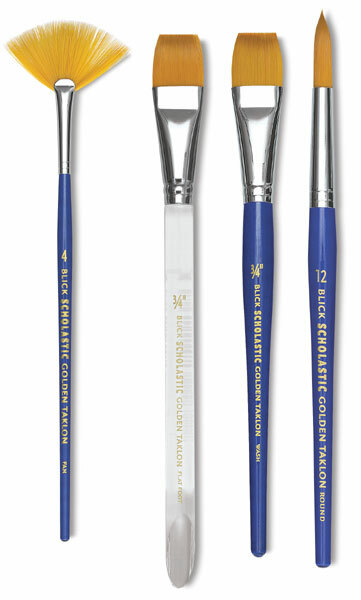 These short-handled brushes are perfectly balanced for watercolor painting. The soft, Golden Taklon filament delivers plenty of spring and good flow. The handles are finished in a blue gloss, and the ferrules are seamless, polished, nickel-plated brass. The handle of the Flat Foot brush is clear acrylic with a flat end for scraping. Flat Wash, Set of 4, Short Handle — This set includes sizes ¼", ½", ¾", and 1". Round, Set of 6, Short Handle — This set includes sizes 0, 1, 2, 4, 6, and 8. 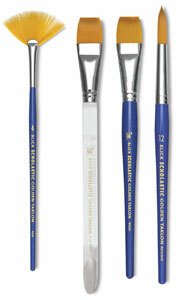 Flat Foot, Set of 4, Short Handle — This set includes sizes 1/4", 1/2", 3/4", and 1" brushes. Fan, Set of 3, Short Handle — This set includes sizes 2, 4, and 6.